Gage Dixon had a knack for finding werewolves. And he had gathered them together to join him in Dallas SWAT. Together, they were able to use their abilities to help others, infiltrate the almost impregnable, and basically get the job done. It was dangerous, and difficult, and it would be impossible if non-werewolves were around. But that would be almost preferable to his newest challenge. A female reporter. Mackenzie Stone knew something was wrong with the SWAT team. Nobody was that perfect, and she'd had an informant give her details that made her suspect performance enhancing drugs. She'd been staking out the team until one day the doors were opened for her. She didn't completely trust Gage, knew he must be hiding something. And there was no way to deny the attraction between them. But the question truly was, if she were presented with the story of a lifetime, what would she choose to do? 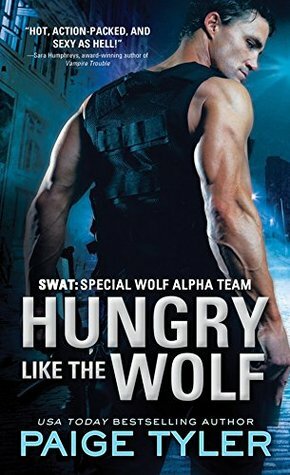 In Hungry Like a Wolf, Paige Tyler has presented a fascinating new twist to the werewolf genre. Gage and Mac's courtship was entertaining, and I was engrossed to see if challenged, how Mac would be able to reconcile her inherent drive to report the truth with the truth of the SWAT team. I loved the members of Gage's team, and of course hope for stories for all of them.